In a double boiler or microwave-safe bowl, melt the chocolate with the honey, butter and salt, stirring frequently. 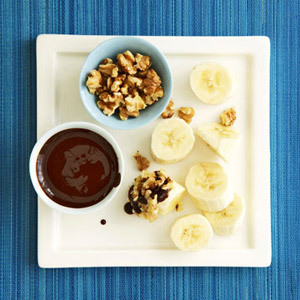 Serve the chocolate sauce and walnuts in bowls for dipping, accompanied by the banana chunks. PER SERVING: 265 cal., 13 g total fat (7 g sat. fat), 41 g carb. (4 g fiber), 3 g pro.